Most of us buy into the promise of marathon battery life when we opt for a new phone, but within months, it often seems like they can’t hold a charge long enough to make a call. Thankfully, there’s an assortment of capable phone chargers available for your car — whether you’re an Apple or Android aficionado — to make sure power isn’t an issue when you’re on the road. The best car chargers, however, combine stylish looks and a low price tag with dependable functionality. Some have enough energy to simultaneously charge your smartphone and tablet, while others distinguish themselves from the pack with a streamlined design and built-in cables. Below are a few of our personal favorites, from the likes of Moshi and Incipio. Just don’t forget to keep your eyes on the road. Moshi has quickly and quietly become the undisputed king of all things charge related. 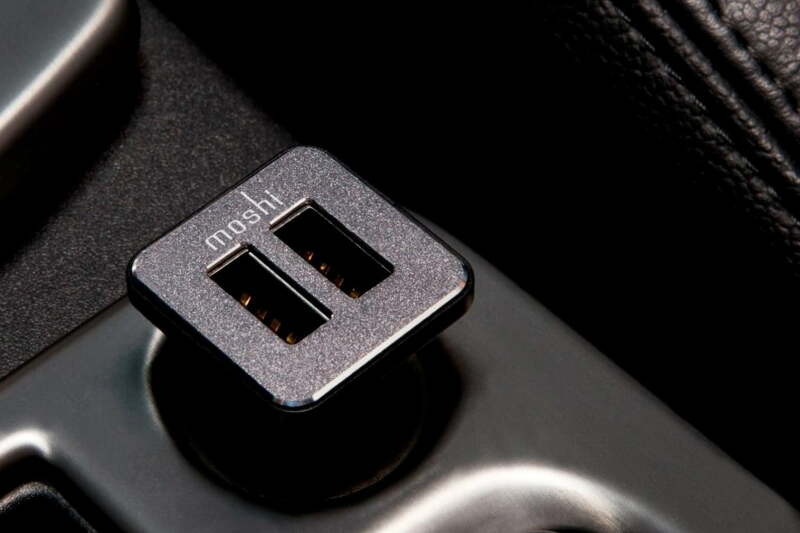 The Moshi Car Charger Duo — previously known as the Moshi Revolt Duo — is a testament to the company’s steadfast approach to charging, offering two USB ports rated at 2.1A (12-watt) for energizing two devices at once. The anodized-aluminum cover is about as attractive as it gets for a car charger, adorned with a simple LED indicator light that delivers a faint glow. The charger’s power management circuitry provides under-current and over-current protection, but it’s the charger’s subtle design that makes Moshi’s flagship offering a favorite. Scosche’s reVOLT Dual is not much of a looker, but the compact charger sports a low-profile frame that sits flush in most vehicle power sockets. Unlike some other chargers in our roundup, each USB port on the sleek device supplies 2.4A (12-watt) of power, which means it’s capable of charging two tablets at a time. The high output also allows it to charge a smartphone quicker than most standard chargers. Oh, and we can’t resist anything that has glowing USB ports. Family road trips can be demanding, on both your smartphone and your patience. Fortunately, Anker’s five-port charger is designed for the rare instances when you might need more than one or two USB ports. The robust, 50-watt device outputs 10A overall — enough to simultaneously power five phones or four tablets — while housing premium circuitry that’s designed to prevent your expensive lineup from overcharging. The unique design also places the hub at the end of a cable, so you can rest the charger on the center console and charge everyone’s devices without having to buy extra-long cords. The polished finish and 18-month warranty only help justify the price. Incipio is a household name when it comes to cables, cases, and chargers. The company’s Dual USB Car Charger doesn’t vastly differ from others on our list. The USB port provides 2.4A of power, for example, but it does feature a built-in Lightning cable for added convenience. It’s also relatively sleek, with rubberized sides and a vibrant, blue indicator light on the front for checking the charging status of your device at a glance. It’s on the pricier side, but you’ll also never have to worry about forgetting your cable. 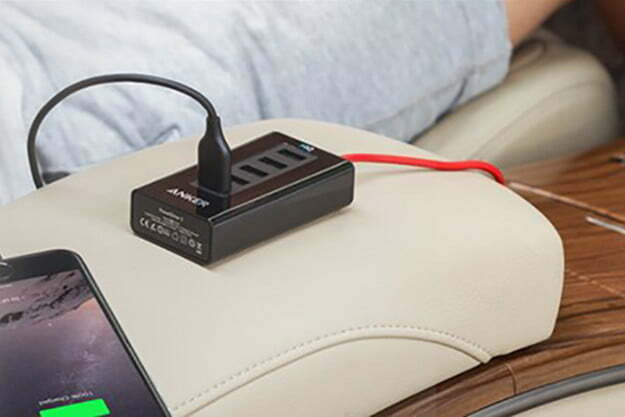 This two-port model from Aukey is one of the most popular car chargers on the market, probably because it works with a range of connection types and is 45-percent more efficient than chargers built with Quick Charge 2.0. That said, the Quick Charge capacity only works with smartphones powered by Qualcomm Snapdragon processors (check Qualcomm’s list here). To minimize the risk of circuitry damage, this model also uses the company’s EntireProtect feature, which helps prevent overcharging and overheating. PowerBear’s Fast Car Charger relies on Qualcomm technology to quickly charge up to two devices simultaneously. Scratch-proof, it’s capable of restoring 75 percent of your battery’s capacity after just 45 minutes of charging. PowerBear promises its device protects your phone, tablet, or GPS against overcharging, short-circuiting, and overheating. It also comes with a 24-month warranty, which isn’t bad for a charger that won’t break the bank. The compact RAVPower Dual USB Car Charger is equipped to charge even the largest and most power-demanding devices. The dual 2.4 USB ports use iSmart Technology, allowing them to learn about your device and output the optimal current in terms of safety and speed. The RAVPower’s charger has also been bend tested more than 12,000 times — a testamement to its durability — and features a convenient LED light for when driving at night. The charger even includes a 3-foot Lightning cable and an 18-month warranty, just in case you encounter any manufacturer defects early on.